Enactive Virtuality Lab is collaborating with the Brain and Mind Lab of the Aalto School of Science, studying how narrative priming affects the viewer’s narrative story construction. Study on-going. Images: Tea (Maria Järvenhelmi), Henrik (Vesa Wallgren) and his son Daniel (Juha Hippi). Short film The Queen (Kuningatar) directed by Pia Tikka, screenplay by Eeva R Tikka. Production Oblomovies Oy and Dreammill Productions and in association with Aalto University 2013. The film has been produced for experimental brain research purposes, which cannot be revealed at this point, as the study is on-going. 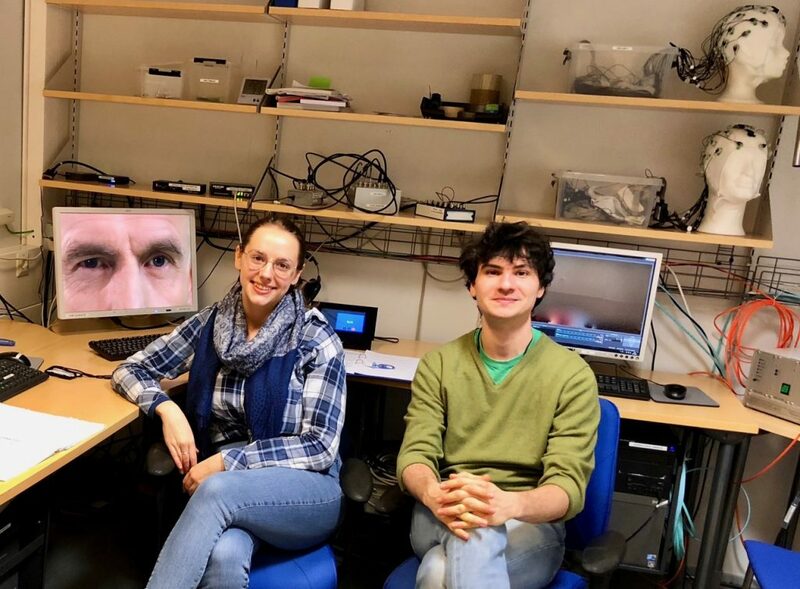 In the image Enactive Virtuality Lab’s student team Angela Kondinska and Michael Becken at Aalto University Behavioural Lab measuring physiological signals of volunteers at the end of October. Collaborators from Aalto School of Science, Brain and Mind Lab are professor Mikko Sams,. Dr.Tommi Himberg, Veli-Matti Saarinen, and project researcher Jenni Hannukainen, Enactive Virtuality Lab, Tallinn University. The two day conference The Collaborative Turn in Art: The Research Process in Artistic Practice deals with artistic research, in particular the expanded understanding of this term and the questions raised by collaborative creative practices. Venue: Estonian Academy of Art s, Põhja pst 7, room A501. Image: Julijonas Urbonas. “Talking Doors” 2009 (Doors Event) Fo more, click the Link to the conference webpage. My talk “Neurocinematics & Art-Science Collaboration” concerned the first hand knowledge gained from several collaborative projects in which I have worked as a consulting film expert, and my own neurocinematic projects in which I have functioned as the principal investigator. I highlighted the diversity of issues one faces in collaborations between artists and scientists. Especially interesting was to reflect conceptual, technological and methodological differences between arts and sciences. The discussion ranged from conceptual to technological issues, however the focus on challenges such as finding shared language, working methods, best division of labor and responsibilities and authorship. 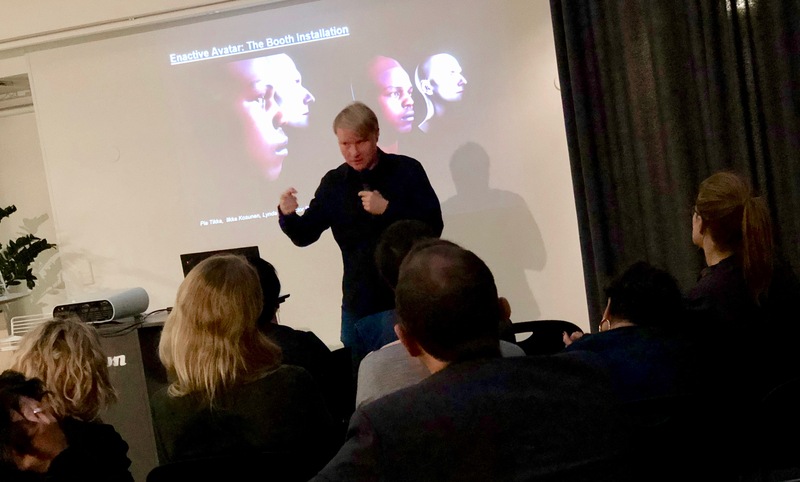 Drs Pia Tikka and Ilkka Kosunen (image) gave a joint talk at the AI & Media Afternoon event on Friday the 12th of October, 2018. The event was held at Miltton offices at Vuorikatu 15, Helsinki, from 16:15 until 19:00. Pia Tikka and Victor Pardinho (video) presenting the latest state of Enactive Avatar pipeline at the meeting of Estonian VR community in Tartu University, Oct 6, 2018.